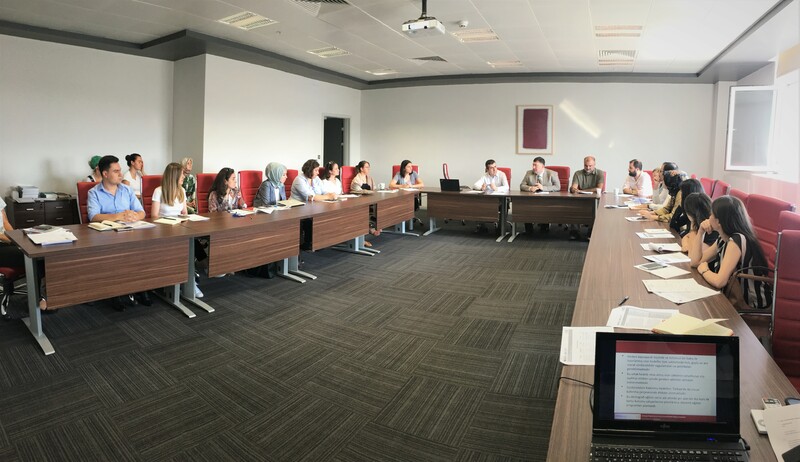 A new “Immigration and Sustainable Development Objectives Training” series started on 9 July 2018 at Hacettepe University, Institute of Population Studies. Since the new thematic area has been selected as Immigration, the new training module developed for public institutes’ personnel working on immigration. These training series have been financially and technically supported by United Nations Population Fund (UNFPA). The aim of the week-long “Demography Training Series” is to enable state personnel to understand and analyze demographic models and data more commonly at the stage of policy development. The training series program aims to build fundamental knowledge and awareness in the field of demography in order to contribute in strengthening the capacities of public institutions. In her opening remarks, Hacettepe University, Institute of Population Studies Director Prof. Dr. Banu Ergöçmen emphasized that Turkey is hosting the highest number of international immigrants. She also underlined that this week-long training’s content has been developed on immigration which surely provide valuable contributions to the representatives of public institutions. She also noted that the liabilities required to be taken by all public institutions with respect to Sustainable Development Objectives on immigration topic will be emphasized by means of this training. Another person who made a speech at the opening of the training series was the United Nations Population Fund (UNFPA), Development Program Reproductive Health Program Coordinator Dr. Gökhan Yıldırımkaya. Dr. Yıldırımkaya started his speech with a brief description of the United Nations Population Fund (UNFPA), Dr. Yıldırımkaya has stressed humanitarian aid efforts developed for Syrian refugees to provide assistance to the Turkish Government’s large scope humanitarian aid program starting in 2011. He also emphasized that more proper and permanent results may be achieved in humanitarian aid efforts with a holistic approach by taking Sustainable Development Objectives into consideration by all public institutions working on immigration. The topics like conceptions, theories, demographic practices, policies and legislation on field of immigration as one of three fundamental fields of demography have been addressed in detail under the title of “Immigration and Sustainable Development Objectives” of the demography training series and they are discussed in context of Sustainable Development Objectives. The details with respect to topics addressed in the training program (e.g. education, health, law, humanitarian aid, employment, gender equality) have been addressed within the framework of different immigration definitions and concepts and international and national legislations, discussed in context of some groups such as refugees, asylum seekers, those having international protection statute, irregular immigrants, human trafficking victims and the Sustainable Development Objectives with respect to these themes are discussed with the trainees.